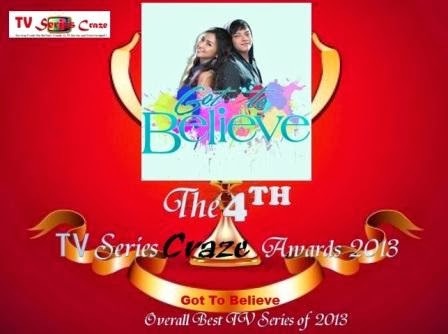 "Got to Believe," the romance-comedy kilig-serye of Kathryn Bernardo and Daniel Padilla in ABS-CBN's Primetime Bida emerged as this 2013's Overall Best TV Series here in our very own 4TH TV Series Craze Awards 2013. "G2B" received an overall percentage votes of 34.07% defeating the other teleseryes like "Juan Dela Cruz" with 21.98% votes placing second and "Be Careful with My Heart" with 9.89% which anded on the third spot. Aside from this major award, "G2B" also received the Best Primetime TV Series title for this year!